Yes, this was a very telling episode! We finally got to see the Goliath Tribe at Tribal Council, and the result was not a good one for Jeremy. Here you had Natalie Cole, who the entire nine days of the game thus far she has been rubbing people the wrong way and totally making herself ostracized from the rest of her camp. She added to her bad resume tonight by being the one to flub her puzzle portion of the Immunity Challenge, and even her “scrambling” seemed to be some of the most painfully awkward social-interaction scenes I ever remember witnessing. I mean, has there ever been a more unlikable, inept player than Natalie? I liked and respected her – even defended her – up through tonight, but it has been growing increasingly hard to do so. As she continued to bark orders, look unpleasant and repeat the idea that she has no chance of winning this game, she actually became more likely to stay. Isn’t that crazy? Survivor has evolved (devolved?) from the early days where the pre-merge vote-outs always had to do with an individual’s contributions to their tribe, albeit around camp or in challenges. If you were weak at a challenge, or didn’t fit in around camp, or didn’t contribute to the shelter or the food, you were gone. Quick and simple. But my oh my are those days gone. 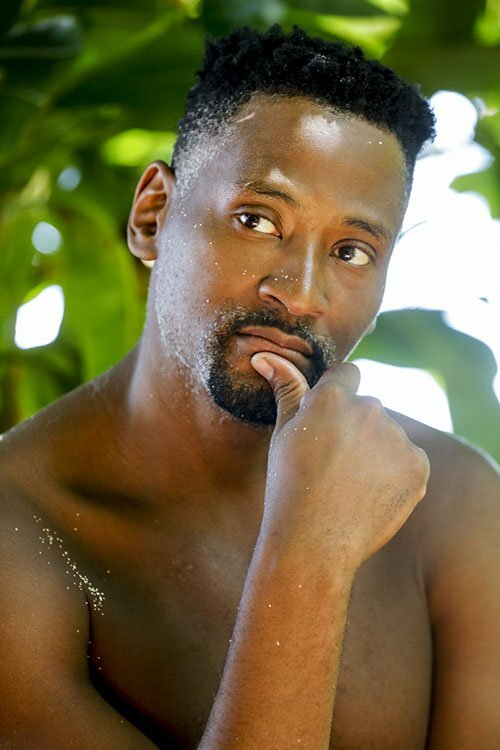 I mean, there hasn’t been a more clear candidate to get voted out of a tribe first than Natalie Cole, and yet here she is, still in the game, with Jeremy out. The tribe mentality – pushed forward strongly by Angelina – was that Natalie can always be voted out later (this in and of itself is one of the ongoing mistakes that Survivor players make, in my opinion). But Jeremy, now there’s a guy who has shown to be a clever, capable guy, whose mind never quite seems to stop. That sort of player – once hardly, if ever, noticeable pre-merge – is now usually smelled early and is gotten rid of immediately. And as Probst pointed out at the episode’s end (man I love Probst’s final words of wisdom each week! ), what Jeremy’s exit really means is that this tribe is capable of turning on anyone…so beware. Now, of course, Jeremy didn’t help his case any, doing crazy things like holding a tribe meeting. Note to future Survivor (or Big Brother) players, but if you have even the thought that calling a tribe meeting is a good idea, just self-evict. Do us all a favor. It’s always painful to watch and it never ever ends well. It’s too bad because Jeremy seemed to have it all, and was a likable guy and character on the show…which is the exact reason he’s gone. Mike really pegged Jeremy tonight, calling him “his own worst enemy,” which ended up being true. Mike actually showed a great deal of self-awareness and social savvy to be able to separate his “liking” of Jeremy from the many red flags that were going off when it came to Jeremy’s game-play. Kudos to Mike, who also reluctantly voted Jeremy out, a move whose repercussions are yet to be seen. 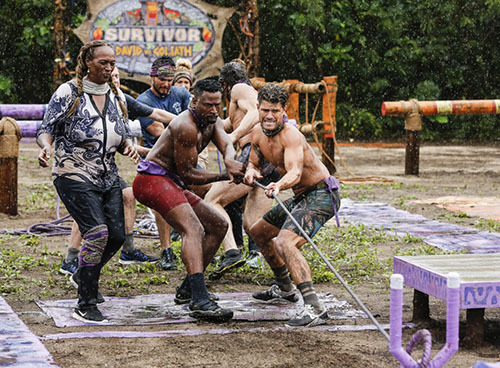 The “David vs. Goliath” theme is all but over now, with the tribe swap coming next week, although the original tribes will most definitely stick together where they can. The Goliaths hold a 9-8 overall advantage, so if there are only two new tribes and not three, they still have odds in their favor. What is a bit odd about a tribe swap right now in the game, is that we are down to 17 contestants, meaning that there are not even numbers for a swap that yields two or three tribes. Will one tribe have an extra member? Will the left-over person be sent to somewhere, like an Exile Island or whatnot? It should be good to see how it unfolds! Last but not least, the other real potentially major development of the night was seeing that Bi suffered an MCL sprain (knee). She is still in the game for now, but will she be able to compete with this injury, and even if so, how will this impact her chances in the game? Episode Take-Away: What I found telling was how the episode played against my expectations. It’s been clear to us all that Natalie has been the target, but when Jeremy was talking about her being “incompetent and over-confident,” he was really talking about himself. Another example of this was at Tribal, when he went on and on about Natalie not being self-aware, but here he was going off on her and making himself a bigger target. Yes, Jeremy suffers from the same lack of self-awareness that Natalie does, although it wasn’t immediately apparent. And think what you will of Natalie, but she was able to expose the weaknesses in Jeremy’s game that only made him a bigger target, and her less of one. Also not to be overlooked was the fact that the David tribe turned VERY quickly on Gabby following last week’s Tribal. Some clever editing avoided Christian ever breaching the subject, but the remainder of the tribe seemed like they were unanimously on-board with targeting her next. 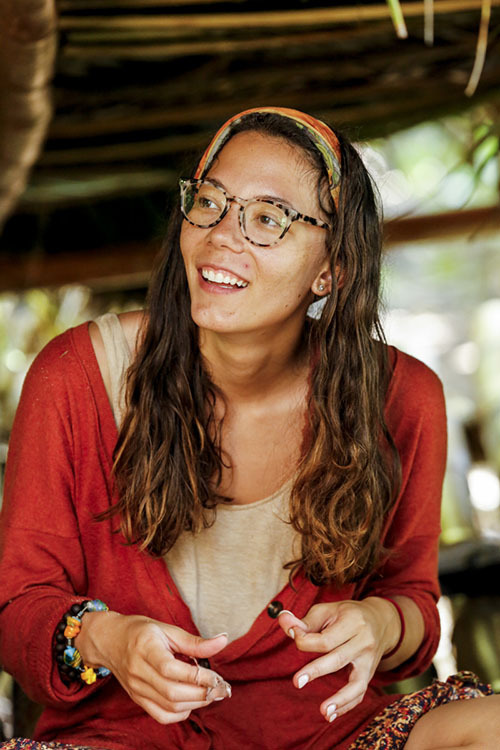 I don’t necessarily care if they do, but PLEASE Survivor Gods, I’m begging you: PLEASE put Gabby and Christian on the same tribe, and let their budding nerd-romance flourish, at least for another few episodes. It is truly my favorite relationship this season (watching them ponder what an actual “SlamTown” would be made up of was just geekiness at its finest. Next Week’s Episode: Drop your buffs! It’s the first tribe shake-up of the season, and for some it will be the worst thing that could ever happen. Quick Note! I appreciate that you are reading this Recap! But just a heads-up, there will NOT be a Podcast or an exit interview this week, as apparently CBS had a “scheduling” issue that is going to prevent me from speaking with Jeremy on Thursday. Big bummer, but completely out of my control! I will be back next week though, and barring any further “scheduling” issues, I should be able to bring you an exit interview next week and the remainder of the season! Those that have followed me also know that I am a RottenTomatoes-approved film critic, and I encourage you to check out my weekly movie reviews (like “First Man,” “The Old Man and the Gun,” “Bad Times at the El Royale,” and “The Sisters Brothers” this week) as I am also the national film critic for AXS.com and am a movie critic/TV personality in the Detroit area. As always, the easiest way to get all of my Survivor coverage and movie reviews is to follow me on Twitter – @tomsantilli – or on Facebook. TELL US – WHAT DID YOU THINK OF TONIGHT’S EPISODE? 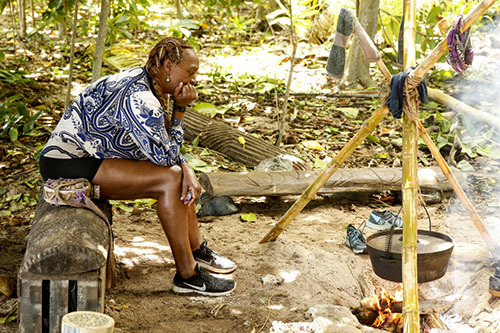 DID THE GOLIATH TRIBE MAKE THE RIGHT DECISION IN KEEPING NATALIE IN THE GAME? AND WHAT ARE YOU THINKING ABOUT THE GABBY/CHRISTIAN POTENTIAL ROMANCE?